Network monitoring & server monitoring made easy. Server monitoring and network monitoring software from the cloud. Monitor the uptime of your network 24/7, and receive instant alerts to prevent network downtime. 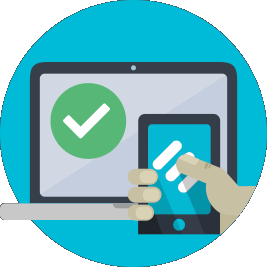 Monitor everything within your network and servers; view your network status and reports on your PC, Tablet or smartphone from anywhere in the world. Monitor every element of your network. Use our network monitoring software to monitor every element of your network such as server, CPU, LAN, wireless LAN, disk space, router, bandwidth, memory and much more. With the Uptrends Infra network monitoring software, it is easy to optimize the performance of your network. 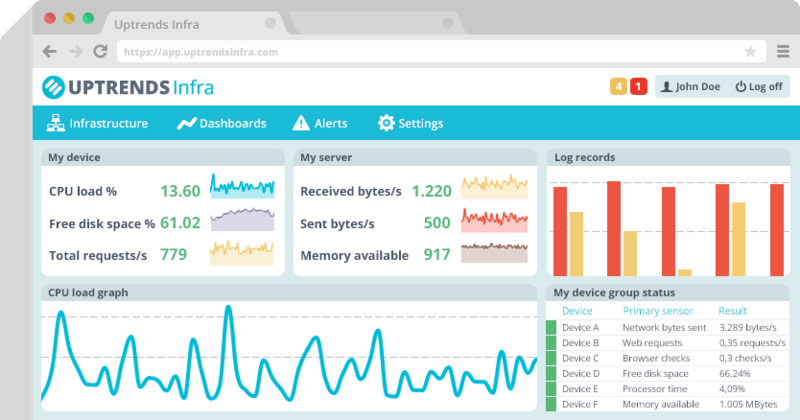 Uptrends Infra is based on different network monitoring protocols which makes it possible to monitor many devices within your network. The following protocols are part of our network monitoring service: SNMP, Ping, Connect, HTTP, SMTP, FTP, Performance counters (Windows & Linux), WMI, Xpath and much more. External website and server monitoring. Uptrends Infra is the next generation network monitoring tool that can monitor internal and external elements of your network & server. Monitor your network, website and server from the end-user perspective from 100+ locations around the globe. Monitor server, URL, website performance, load time and transactions. 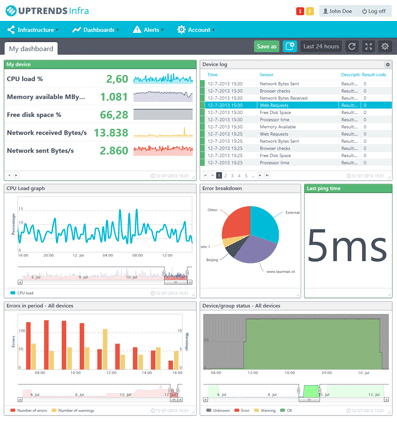 Network monitoring software with custom dashboards. With our network monitoring software, you are not only in control of the reports you want to see, but how they are displayed as well. Create tailor made dashboards and drill down to view the details of a specific device of your network. Dashboards are optimized to be viewed on PC, Tablet and smartphone. Network monitoring tool with instant alerts. In case of failures, the Uptrends Infra server and network monitoring tool will send instant alerts by SMS, e-mail, Twitter and IM. Define who needs to receive alerts and when and schedule maintenance periods. View the status of your network and manage the settings wherever you are. Network and server monitoring from the cloud. Monitor your network and server from the cloud and access reports or manage settings from any location. The network and server monitoring service is offered as Saas. Install our secure agent to start monitoring internally. For external monitoring, only the URL or IP address is required to start monitoring. Here's why customers love & trust our network monitoring service. Uptrends Infra provides an all-in-1 hosted network monitoring solution. Receive alerts, analyze errors and prevent future issues. Monitor CPU, bandwidth, router, server, memory, disk space, cloud server and much more. External website monitoring such as uptime, load time and transactions from 120+ locations. Use SNMP monitoring, ping, connect, HTTP or performance counters (Windows & Linux) to monitor every element of your network. Define which data you want to see, in which format. Drag and drop dashboard graphics. Export data to any format. Optimized to be used on your PC, Tablet and Smartphone. Network monitoring from the cloud. Use it from any location in the world. No software installation required. Affordable network and server monitoring software. Pay only for what you need, it fits into any budget. Starting at only $20 per month. The most advanced reports of any network monitoring software out there. Create custom dashboards and personalize data. Share information. Our network monitoring software will make your job much easier. In 5 minutes you are deployed and configured. This is how it works. 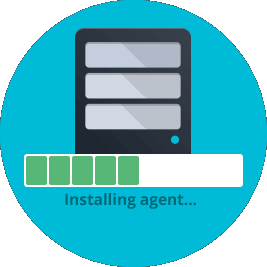 Start by downloading the lightweight and secure Uptrends Infra Agent. Install at least one Agent in your network, on Windows or Linux. The Agent immediately starts pushing data to the Uptrends Infra cloud application over a secure connection. Adding devices and sensors is easy and just takes seconds. Monitor multiple devices with just one agent, or install agents on each of your devices. 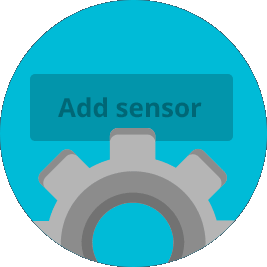 Each new device gets default sensors for CPU, memory, disk and network usage, but you can add as many as you like. In 5 minutes or less you’re installed, conﬁgured, and receiving monitoring data. Get started now and see why thousands of customers trust our monitoring services! Start using Uptrends Infra today! Many Fortune 500 companies and small to medium sized companies, rely on our network monitoring tools. Uptrends' services have helped thousands of IT professionals optimize their network performance across the globe. High availability of systems is critical for us and Uptrends provides a superior network monitoring solution as compared to other tools that I have used in the past. It provides critical fault and performance data from the network and makes my job much easier.